Having a child on the way is definitely an exciting time. As you put together the nursery, you’ll find it a lot of fun to choose a theme and decorate it so that your little one will feel safe and comfortable. One thing you might not have thought about, especially if it is your first child, is that babies sleep at different times of the day and night, so having a bright sunny nursery that looks great won’t be much of a comfort when they are sleeping during the day. Blackout shades are the ideal solution because you can open them up when it is awake time and put them back in place when it is time to sleep. It isn’t just the sunlight that makes it difficult to sleep. The UV rays can be a problem as well. They can make the room uncomfortably warm. Too much sun and those UV rays can also be dangerous for their sensitive eyes. If you like the idea of blackout shades but envision something bulky and ugly, you’ll be happy to learn that many stylish options are available today that don’t even look like blackout shades. They can also be custom crafted to fit any size window. Blackout shades are great for anyone who wants to get a bit of sleep during the day. With motorized options, you’ll be able to easily darken a room for a nap yourself while your baby rests comfortably in their room. Another great use for blackout shades is to reduce the sun’s harmful rays and glare wherever that would be needed, such as a media room, wine storage area or home office. If you would like to know more about blackout shades for your nursery or another room, give us a call at Ashtons Blinds. 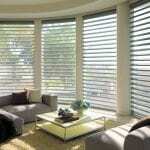 We can offer a free in-home consultation to assist you with selecting the right window coverings for your home. We’ll take care of the measurements and then call you when they are ready to schedule the installation. You and your baby will sleep easy when we’ve taken care of the final touches on the nursery.